So I decided to do some doodling today and came up with a very nice hamlet or farmstead. 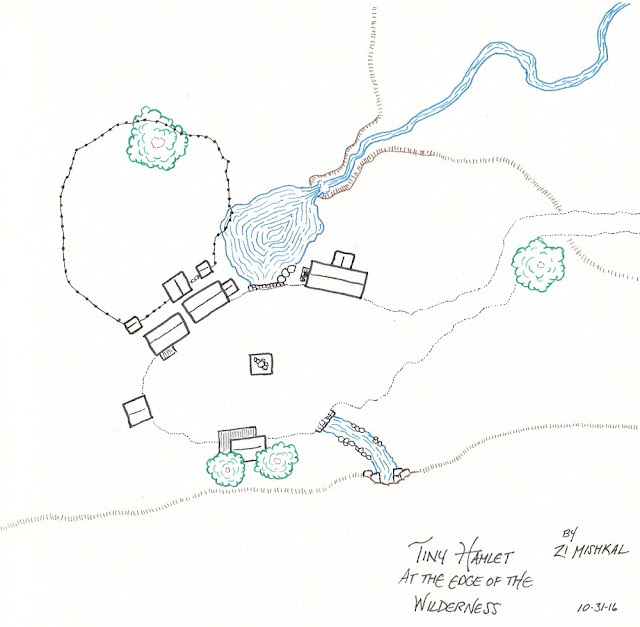 The map is a small settlement - it could be a hamlet or a large farm set somewhere near the edge of civilization. Most of the buildings are to the north of the central clearing, with a fenced in area for some livestock and an attached barn. There's a statue in the center of the clearing. It could be some old family relative or perhaps the founder of the hamlet. Maybe it's to the local deity. to the south is another house with a large wrap-around porch. I think of this as the blacksmith, personally. Just to the right of the blacksmith is a stream that flows out of a cave opening, under the central area and into a pond on the north side. A small escarpment in the northeast allows the pond to escape as a waterfall into a small ravine. Lastly, some scattered trees dot the area, which is otherwise grassland.